In Hollywood, the best actors do not always get the leading roles. While the general audience appreciate good acting, they also want their leading men and women to look nicer, have better physique, bigger breasts and so on. In the mainstream compact sedan market, the Mazda3 constantly outperforms its rivals in many measurable categories but in overall sales, Honda Civic and Toyota Corolla always seem to get the last laugh. There are number of reasons for this: people being superficial is one. Another could be that, compared to Honda and Toyota, Mazda is a relatively small company which, among other things, has to stretch its budget a little longer. 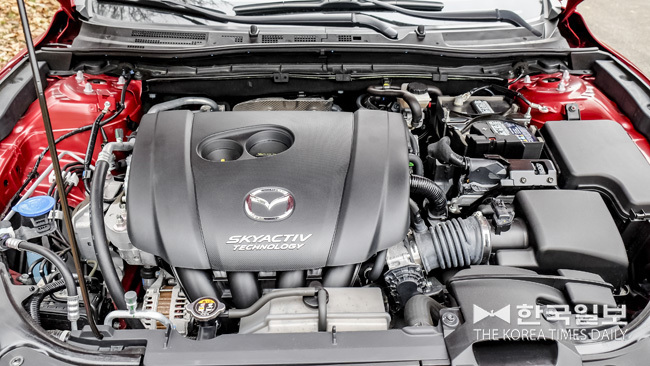 Bigger manufacturers can introduce completely redone models every three or four years; Mazda makes incremental changes. In its present form, the Mazda3 has been around since 2013 or so. While the styling of the next generation model – recently unveiled in LA – is a significant departure, one notes evolutionary, not revolutionary changes. By the way, the ‘Sport’ in Mazda3 Sport just means it’s a hatchback. It is not necessarily sportier than its sedan counterpart. Because it’s been around for so long, most bugs have been worked out. Engineers have also made improvements over the years, adding such goodies as torque-vectoring, radar cruise control, etc. Staying true to its ‘zoom zoom’ heritage, the Mazda3 is probably the best handling car in its class. When it comes to the Mazda3’s exterior styling, not everybody seems to be in agreement. According to this writer’s admittedly most unscientific research (like talking with few friends), more Caucasians seem to like it than Asians. 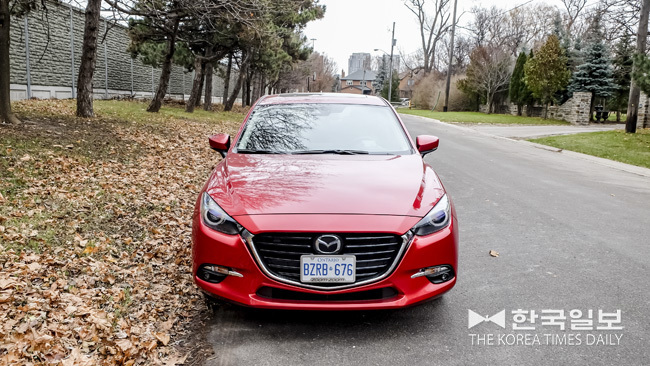 The measure of beauty, however, is subjective and if you happen to like the Mazda3’s styling, this writer will not hesitate to recommend it. As mentioned already, the Mazda3 can be had in both sedan and hatchback guise. This writer will go for the Sport (i.e. hatchback) every time but, again, beauty is subjective. The Mazda3 Sport is not the least expensive car in its class. The base GX model starts from $19,900 before taxes and mandatory gouging. The GS demands $24,000. Both models share the 2 litre naturally aspirated four-cylinder engine good for 155 horsepower and 150 lb-ft of torque. The top-of-the-line GT provided to this writer starts from $25,000 and goes up to $28,200 with options. To differentiate itself from the lesser siblings, the GT gets bigger 2.5 litre four that pumps out 184 horses and 185 lb-ft of healthy twist. Engines can be mated to either six-speed auto or six-speed manual. Others are boasting trannys with eight, nine and even ten forward gears but Mazda’s six gears, automatic or manual, work just fine. 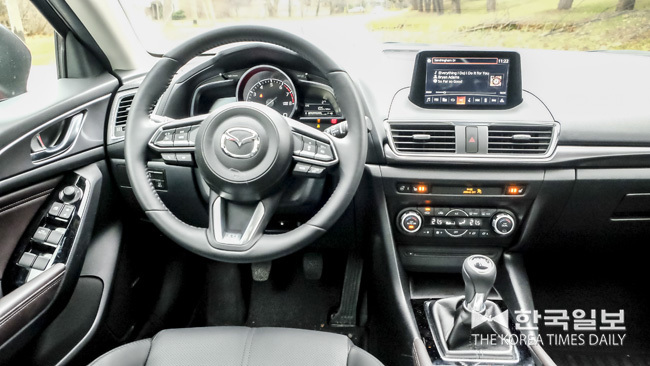 Interior of the Mazda3 still feels clean and simple. It has aged well overall, but the infotainment system should be updated. The screen is too small and the interface is not among the most intuitive. This writer wishes for head-up display (HUD) in all cars. But, please project the info properly on to the lower windshield, not on the flimsy plastic panel like in the Mazda3 GT. Forward visibility is very good and heated leather seats are supportive as well as all-day comfortable. Heated and leather-wrapped steering wheel is also appreciated. The steering wheel has satisfying heft and is accurate, if not overly communicative. The GT test-vehicle also gets Bose premium audio with nine speakers, navigation, auto climate control, as well as such safety systems as blindside monitoring, lane-keep assist, brake assist and aforementioned Mazda Radar Control Cruise (MRCC). The GT’s suspension has struts up front and multi-link setup in the rear, contributing to the nimble handling and stability at the cornering limits. This front-wheel-drive car has no perceptible torque-steer and the ride, while taut, is adequately supple going over bumps. Another thing Mazda does better than most is the manual transmission. 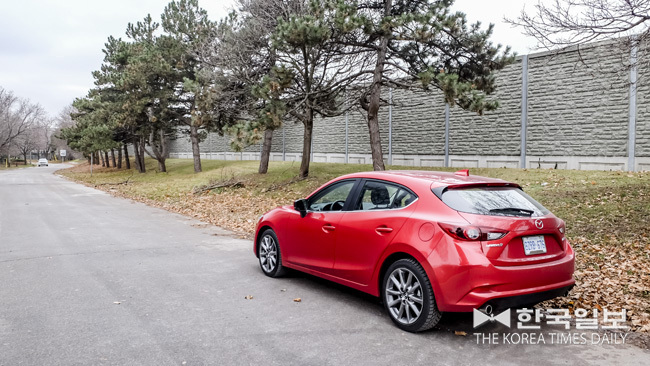 Compared to the Toyota Corolla Hatchback this writer test-drove about a month before, the Mazda3 GT’s stick feels crisper and the clutch is easier to modulate. However, the bigger 2.5 litre engine suffers bit at the pumps. The official rating of 9.6 litres per 100 km in city and 7 litres on highway is on the thirstier side, compared to the immediate rivals. Those wanting better mileage should consider GX and GS models. Athletic, practical and dependable, the Mazda3 Sport has plenty of power for everyday situations and its fun-to-drive quotient is arguably best in its class. People looking for compact cars need to give it serious consideration.